Pidgin 是一個聊天程序，可讓您同時登錄到多個聊天網絡上的帳戶。這意味著您可以在 MSN 上與朋友聊天，在 Google Talk 上與朋友聊天，並同時坐在雅虎聊天室中. 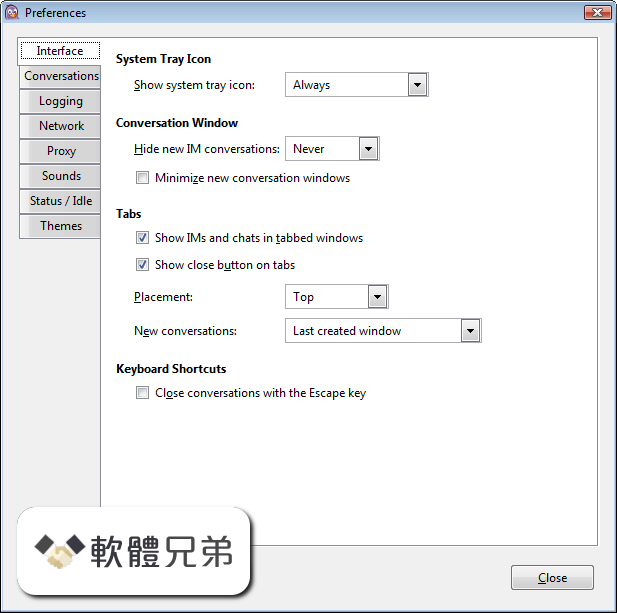 Pidgin 與以下即時聊天網絡兼容：AIM，ICQ， Google Talk，Jabber / XMPP，MSN Messenger，Yahoo！，Bonjour，Gadu-Gadu，IRC，Novell GroupWise Messenger，Lotus Sametime，SILC，SIMPLE，MXit 和 Zephyr。它可以支持更多的插件. - Properly handle AUTHENTICATE as a normal command with server prefix. - Fix a crash caused by a use after free of the MOTD. - Fix an out of bounds read in irc_nick_skip_mode. Description: Multi-protocol instant messaging client. Upstream URL: http://pidgin.im/. License(s):, GPL. Maintainers: Evangelos Foutras. Package Size: 1.3 MB. Pidgin 2.13.0 has been released!! pidgin-2.13.0.tar.gz, 2018-03-09, 12.9 MB. 12 &middot; pidgin-2.13.0.tar.bz2, 2018-03-09, 9.0 MB. 495 &middot; pidgin-2.13.0.tar.gz.asc, 2018-03-09, 195 Bytes.